The management of customer data belongs to the elementary tasks of a bank. Mostly, specially tailored software is used on the bank side to suitably represent all customer data. A part of this data in turn is required for the operation of the bank server. But how to avoid redundant data management of customers, users, accounts, permissions, etc? The answer is quite simple: Masterdata! 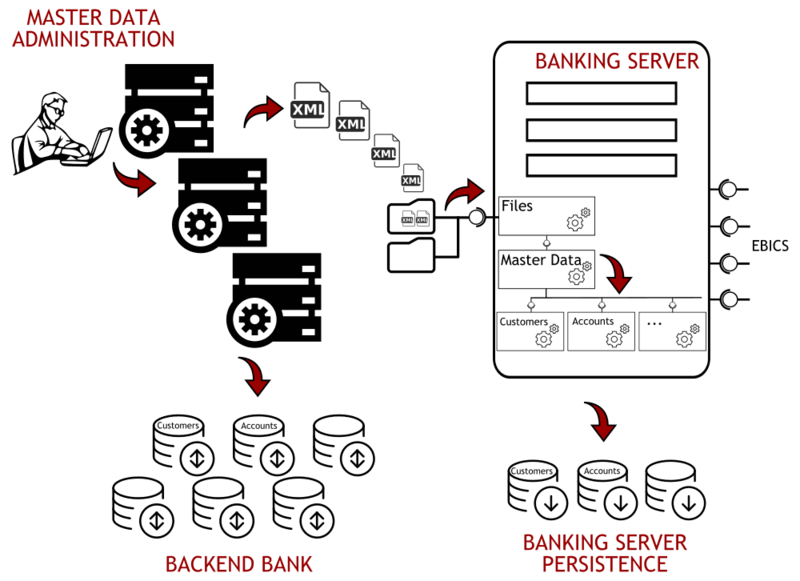 The synchronization of backend data and the work data of the BL Banking Server is taken care of by the Masterdata interface. It allows the safe and easy transfer of the data from the leading system into the Banking Server — completely automated. For this purpose, the data to be exchanged are provided as XML files to the interface, which on the bank side can simply be generated from the bank's backend data sources. The format of the XML files allows both the mapping of single addings, modifications, or deletions as well as mass processing. However, the data transfer is enormously practical not only in the ongoing operation of the Banking Server. Also, using the Masterdata, the migration to the well-established server software of Business-Logics is just a finger exercise, because for the data migration only XML files with the backend data need to be generated. For more complex migration steps, such as the key import or script adjustments, other sophisticated plugins are available. By the way, also the Aareal Bank uses full Masterdata matching, and thus achieves a 100% synchronization of the backend with the Banking Server of Business-Logics. Talk to us to arrange a test installation to get an idea of the extensive migration tools and the performance of the BL Banking Server.